In December 2017, the Chief Executive of Samsung Heavy Industries, SHI, Park Dae-young resigned from the world third largest shipbuilder. Dae-young threw in the towel following financial losses that cost the company about a third of its market capitalization. The CEO appeared left with no choice as SHI under his watch according to Financial Times, forecasted losses, not only in 2017 but 2018. In that forecast, SHI expected sales of US$ 4.7 billion in 2017, a drop of 35%, an operating loss of US$499 million and a further loss of about US$278 million in 2018. In reaction, shares of the Korea giant dropped a staggering 27%, the lowest since December 2016. Quoting Park Moo-hyun of Hana Financial investment, Financial Times wrote “Samsung Heavy has been relatively less competitive in winning new orders (for commercial vessels), while Hyun-dai Heavy and Daewoo shipbuilding have won many new orders for VLCC, (very large crude carriers) and LNG (Liquefied natural gas) ships respectively. This has made its financial situation worse”. But the trouble of the Korea based corporate giant did not start in 2017. It indeed dates back to the 2008 global financial crisis. Since then, Samsung has struggled. Between 2010 and 2013 however, hope came the way of Samsung. This was when Total Upstream Nigeria Limited, TUPNI, in joint venture with the Nigerian National Petroleum Corporation, NNPC, called for tender for the US$3.1 billion contract for the construction of the Floating Production Storage Offloading, FPSO for the Egina deep water oil field. This was exactly how the path of Total and Samsung Heavy Industries, Nigeria, crossed. 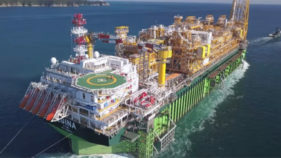 The Korean behemoth and Lagos Deep Offshore Logistics, LADOL, agreed to jointly tender for the Total Egina FPSO as main contractor and Local Content Partner respectively. Their bid was successful and so they won the massive contract. For many close observers, this contract was a godsend for Samsung. Total had given it a lifeline at a most trying period. Samsung however did not seem to share this sentiment as it commenced the execution of the contract on a rather combative posture. This belligerent attitude would become the ordeal of LADOL and later Total which had watched Samsung’s bellicose tendencies with a comportment analysts described as loud indifference if not cold complicity. Perhaps haunted by its dwindling fortune, Samsung seemed, from the start, to be driven by an inordinate quest for profit. Take for instance its first issue with LADOL. The partners had agreed that if their tender was successful, a joint venture to be known as SHI Mega Construction and Integration Free Zone, SHI MCI- FZE would be set up. The well applauded vision was for this company to construct and own the upgraded fabrication and integration facilities at LADOL with 80% ownership by LADOL and 20% by Samsung. This ownership structure was based on the fact that the upgrade of the fabrication and integration yard at LADOL was one of the Local Content facilities approved by the Nigerian Content Development and Monitoring Board, NCDMB, and committed to by Total for the Egina FPSO contract. For this reason, the Egina FPSO contract set forth a provision for Total to pay Samsung the sum of US$214 million for the upgrade of the fabrication and integration facility, as a contractor to Total, in fulfillment of Total’s Local Content obligations and commitment to the Nigerian regulators. It was simply like a sub-contract to which Samsung was simply paid to actualize as a contractor. The US$3.1 million Egina FPSO contract therefore included the US$214 million for the upgrade of the facilities at LADOL. But Samsung did not reveal this to its local partner. And Total unfortunately also kept what would later turn out a complicit silence. Total’s mute indifference would energize Samsung to hide the US$214 million in its pocket and to unilaterally fix the EPC costs of upgrading the fabrication and integration facility at LADOL at US$300 million. Not done, Samsung insisted on providing corporate finance on its own terms, urging LADOL to pay US$240 million as debt and equity to pay for its 80% ownership of SHI MCI- FZE and the facility. The deadlock that followed the partners’ disagreement led to Samsung purportedly terminating the partnership with LADOL. Driven by a fierce sense of justice, LADOL went to court to seek redress. For LADOL, just like the revered late American civil rights leader, Rev. Martin Luther King Jnr put it, “Every step toward the goal of justice required sacrifice, suffering and struggle …..”. And so LADOL bore its pain as it lost almost 80% of its shares in the facility after a resolution of its dispute with Samsung outside the court. But by 2018, justice like the sword of Damocles, came to prevail. At the public hearing of the Nigerian Senate AD hoc Committee investigating the local content elements of the Egina project, it emerged for the first time that Total had paid Samsung about US$214 million for the upgrade of the facilities. 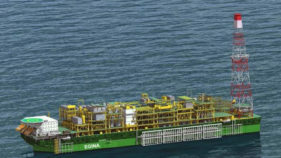 Total, in fact, accepted that the US$214 million was included in the US$3.1 billion Egina FPSO contract. Dimeji, a Chief Executive of an oil company, who requested that only his first name be used, attended the Senate Ad Hoc committee public hearing and had this to say, “what Samsung did is a swindle, pure and simple. Some countries would have expelled them instantly the moment it was revealed that Total actually paid the US$214 million. It was a pure sabotage of Nigeria’s quest for technology transfer”, he stated. This shocking revelation would however not change anything for Samsung. It still went about the media insisting, affirming and proclaiming its ownership of the SHI MCI-FZE. But as an oil and gas writer put it, “Samsung had to do this. It was a desperate move”. Indeed back home in Korea at this time, the parent company was in acute financial crisis. SHI had made a US$1.4 billion new share issue following a US$1 billion issue in 2016, which would be used to pay down debt and reduce the risk of banks limiting lending to it due to its weak earnings prospects. Analysts say that the company’s ability to win new orders had been constrained as it has been squeezed between bigger domestic rivals (Hyundai Heavy industries and Daewoo Shipbuilding and Marine Engineering) and lower cost Chinese players. To cap the economic nightmare, it has been slow to respond to its worsening financial situation. The Egina FPSO project was an opportunity, it seemed, for Samsung to extract maximum profit even if by all means necessary. The US$214 million exploitation was therefore only a prognosis of what was to come. With U$499 million lost in 2017 and another projected U$278 million loss in 2018, Samsung would become stringent if not desperate to halt the slide. Since the Egina FPSO was still within its mortal grip, Total would become a target for the much needed quantum dollars to bear up a withering giant. A top technocrat in one of federal government’s oil and gas related agencies averred that Total must be naïve to think that Samsung’s legal battles with LADOL would be the end of everything. “In fact, Total was the target. Samsung knew they had money and would try to pay any claims they make to get the FPSO job finished on time”, he added. He pointed to a letter written on August 26, 2014 by Samsung to Total which he was privileged to see. Titled Change Order Request on Engineering and Schedule/Cost Impact in Project Progress/ Completion for the Egypt FPSO Project, this letter he said was a subtle insight into what to expect in the future. “Although Samsung affirmed their resolve to deliver the project within reasonable time limits, they complained subtly about the Basic Engineering for the FPSO design which was done wholly by Nigerian engineers, there were talks about a lot of loose ends and the overwhelming volume of extra works they had to do. If you are discerning, it was easy to tell that the bill would soon start tumbling in and they will call it variation,” he concluded. This seeming ominous prophecy became a dreadful reality. By 2018 the bills from Samsung started cascading in the name of variation. They came in different tones; some covertly, others overtly laced with threats to stop work on the FPSO. On April 30, 2018 precisely, Samsung issued Notice of Dispute against Total, requesting a confounding variation of US$1.6 billion. “That was enough to take care of their loses in the last two years with some profit on top, if you ask my candid opinion”, said Nnanke John, a Cross River State, Nigeria based oil and gas industry development analyst. In a letter dated 1st June, 2018 and directed to the Group General Manager of National Petroleum Investment Management Services, NAPIMS, Samsung stated, “We are operating under a significant financial loss of US$1 billion”. It therefore appealed to NAPIMS to help resolve the dispute. Curiously, the Korea giants still claimed to have lost US$300 million due to its investment in the yard at LADOL. This was inspite of the fact that it had become common knowledge that Total paid US$214 million to same Samsung for the purpose of the upgrade of the LADOL yard. By July 12, 2018, Samsung had served Total Notice of Pre-Suspension of Work, stressing its intention to stop work unless Total paid, pronto, a variation of US$500 million. For those who had followed the increasingly twisted relationship of Samsung and Total and the Seoul based company’s convoluted journey, it was clear that the court of law would be the final theatre to straighten what had become a knotty matter. And on July 31, 2018, Samsung pitched a date with providence as it dragged Total to a Federal High court in Lagos state in a suit No. LD/2744-GCM/18, seeking injunction to stop Total from terminating its contract with Samsung and moving the Egina FPSO from LADOL yard. Samsung suffered a lethal wound as the High Court on July 31, 2018 ruled against it and threw out their case against Total. Although an Arbitration has been planned for London and Total, had agreed to consider payment of US$800 million, Samsung appeared desperate to get at least US$500 million even before the arbitration. It was this rash of extreme behavior that would prove its final undoing. Exactly six days after its case was thrown out, Samsung returned to the Federal Court once again. This was on August 6. It was seeking the same injunction to stop Total from terminating its contract and moving the Egina FPSO from LADOL until the conclusion of the arbitration over its variation demand. On August 29, the Federal High Court again ruled against Samsung and threw its case out. And this deep legal laceration was coming after their case at NAPIMS had ended in a fiasco. NAPIMS in a terse statement had given Samsung until Friday, July 24, 2018, to launch the FPSO from LADOL or face termination of their contract and 10 year ban from working in Nigeria. Having taken some dizzying legal pounds, worsened further by NAPIMS ultimatum, Samsung had to depend on the goodwill of Total and Ladol for access to LADOL yard to complete their scope of work on the Egina FPSO, as its operating license had expired. But Samsung is tenacious. They are still clinging to some blinking hope. They believe that the current Nigerian government and its oil and gas agencies have been grossly unfair to them. 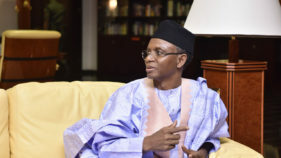 They are hoping that 2019 elections may usher in a new and more friendly leadership, where their ‘connection to the seat of power’ is assured and where they would indeed be in a solid stead to call some shots. This government to come, they eerily believe would then compel NNPC/Total to pay them their purported variation of US$1.6 billion. Can Samsung count on this ghostly dream?